Do you love Christmas? Making Christmas treats is one of my family’s favorite Christmas traditions! Lots and lots of treats, to be exact! 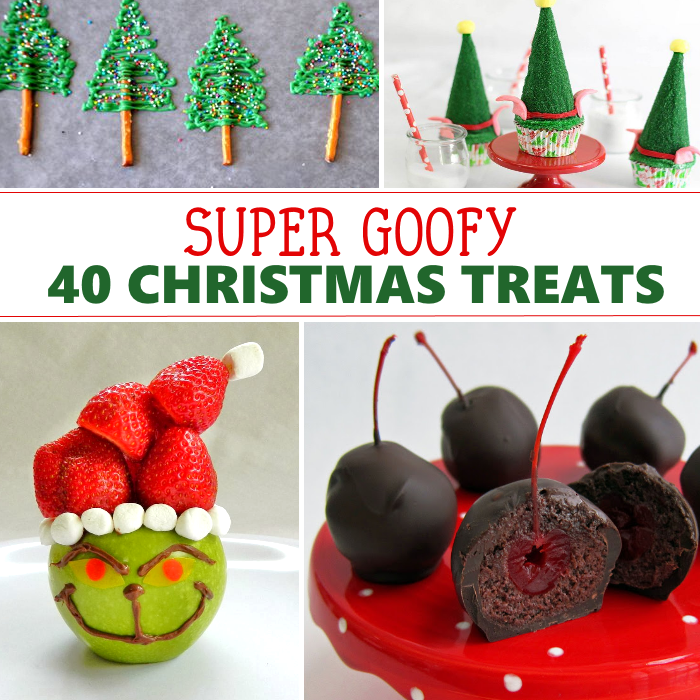 Here are more than 40 easy and fun Christmas Treats for you to try with your family! Isn’t it funny how sights, sounds, and tastes make up so much of those special holiday memories? My great-aunt passed recently, and she was the major cookie maker in our family. With just a bite of one of her cookies, I am transported back to my childhood Christmases with her! Penguin Bites, from Delightful E Made, are made with a nutter butter of your choice. You can swap that out for sunflower seed butter if you are baking for someone with a nut allergy, too! Totally the Bomb‘s Elf Rice Krispie Treats totally look like little elf hats, and they are so fun to make! Santa Nutter Butter Cookies… I don’t need to say any more! Loving this yummy recipe from Simplistically Living! 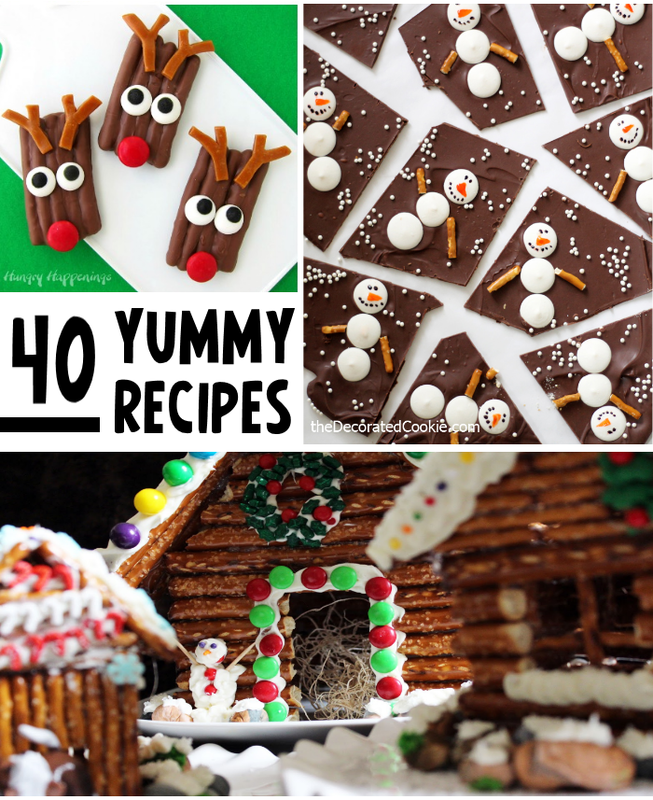 This Christmas Crack recipe, from I Heart Naptime, is such a Christmas classic! So easy it is to make, too! One Little Project At A Time‘s Easy Christmas Tree Brownies are just that! Easy! All you need is a wedge pan and green frosting! Betty Crocker‘s Fudge Inside Cookie Cutters are the cutest way to gift fudge! I never would have thought to package them inside a cookie cutter! Snowman Cookies, from Taste of Home, are so sweet! complete with jaunty hat! Tastes of Lizzy T‘s Buck-Eye Brownie Cookies are the best mix of chocolate and peanut butter! 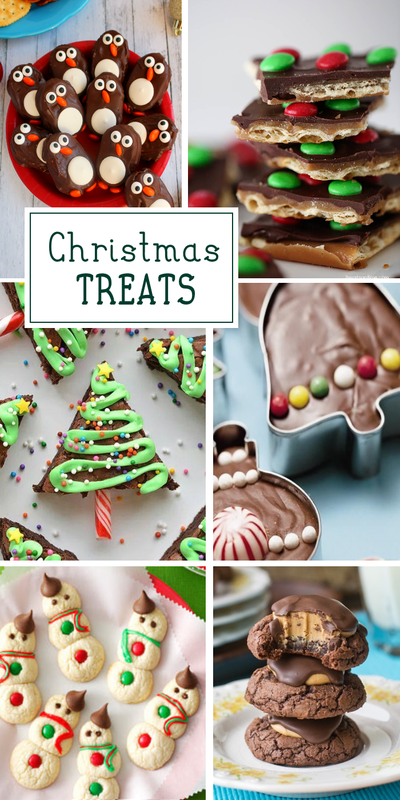 That’s kind of an oxymoron… kids love all Christmas treats, but these recipes in particular will leave visions of sugarplums dancing in their sweet little heads! Cookie Butter is basically a spreadable cookie! You can use it to help decorate your gingerbread house, too! My daughter loves helping me make Simplistically Living‘s Holiday Mug Cake. She gets a kick out of the fact that her cake is in a mug! Pretzel Reindeer, from Hungry Happenings, is a super chocolatey Christmas cookie recipe that’s easy to make! The Decorated Cookie‘s Snowman Bark is a cute way to decorate your bark! Who wants to have a gingerbread house, when you can have a log cabin? Create Pretzel Log Cabins with this cool idea from Worth Pinning! Some of my favorite holiday memories have taken place in the kitchen, making Christmas treats with my family and friends. There is something that is so comforting about knowing that each year I will be making the same beloved recipes with my favorite humans. But, there is always room for new recipe ideas! Angel Pretzel Pops are a cute crossover of a cookie and a pretzel! Do you like pecan pie? Try Pecan Pie Cookies, from Spend With Pennies! They are even better! 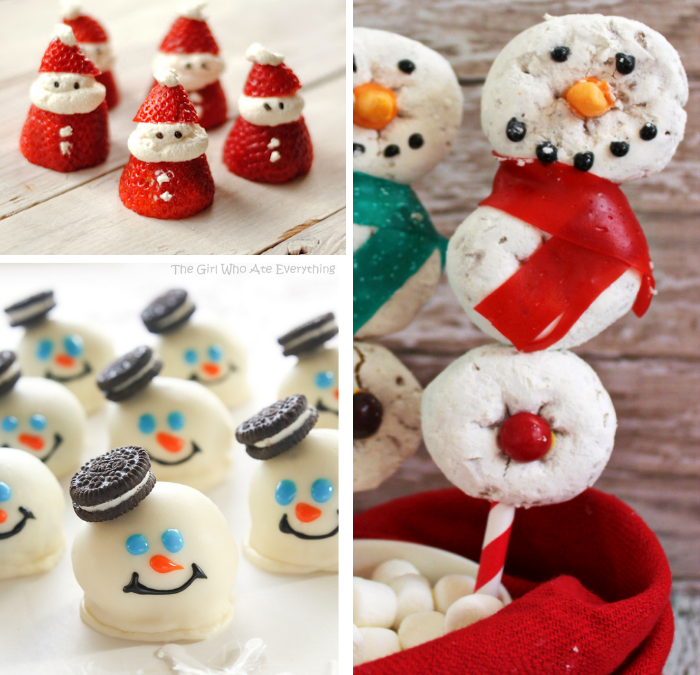 Snowman Donut Pops, from Mommy Musings, are quick and easy. The cutest idea for Christmas morning! Stained Glass Cookies are super fun to make. Try using jolly ranchers when you make them! Transform a marshmallow into a top hat with this Marshmallow Top Hats idea from Inside Bru Crew Life! The best part of Christmas is the magic! I love how Christmas treats remind us of that. It’s magic in and of itself that flour and sugar can transform into delicious creations with a little work and love! Star Studded Sugar Cookies are a tried and true recipe! You can’t go wrong with these sugar cookies! Simplistically Living‘s Snowflake Cookies are so dainty and elegant. They are almost too pretty to eat! Leanne Bakes‘s Strawberry and Cream Santas are the easiest healthier version of a Christmas treat! Snowman Truffles, from The Girl Who Ate Everything, are such a cute way to decorate truffles! Christmas treats are not only yummy, they can help set the atmosphere and make your table more festive! These Grinch Cupcakes, from Confessions Of A Cookbook Queen, are super easy and fun! Sure to ward off the Grinch from your Christmas party! Kitchen Fun With My 3 Sons‘s Reindeer Bites are a fun change from Christmas sweets. They are made from hotdogs and biscuits! Santa Topped Cheesecake Bites, from Cooking Classy, are super simple and yummy! Want something “fancy” and fun, but don’t have time? These Oreo Pops, from It’s Always Autumn, take seconds to make! Just A Taste‘s Chocolate Christmas Tree Cupcakes With Cream Cheese Frosting are gorgeous and easy! Just use green-dyed, melted white chocolate and pretzels! 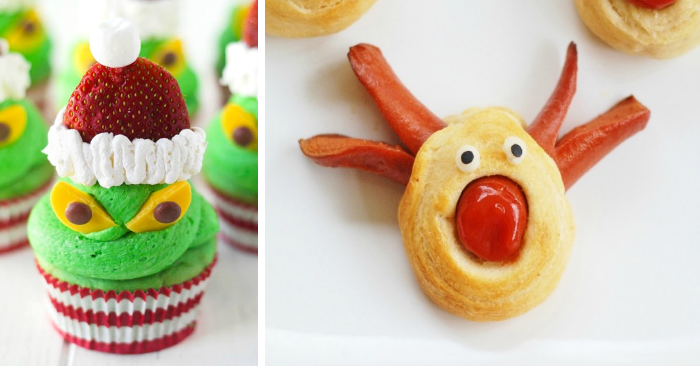 Decorate your cupcakes with elf hats! Loving this Elf Hat Cupcake recipe, from Betty Crocker! Green apples just got a grin with Kitchen Fun With My 3 Sons‘s Healthy Grinch Fruit Snack. 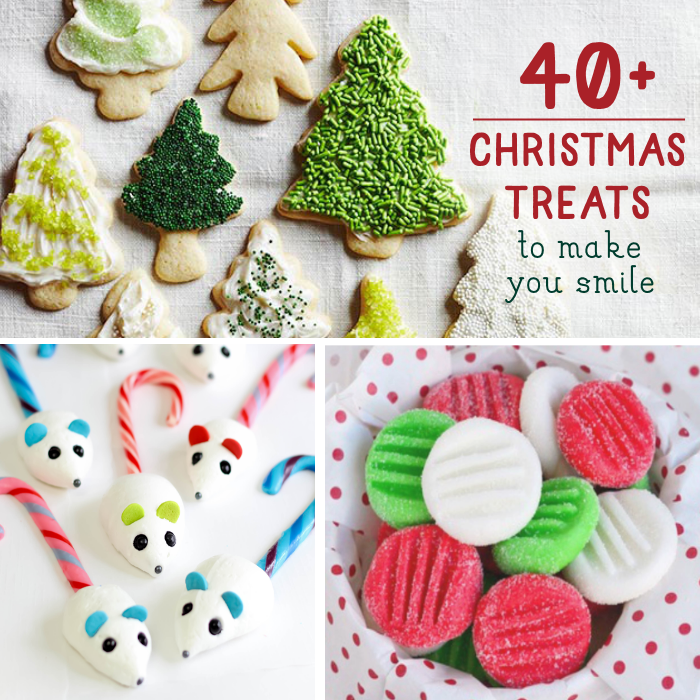 Looking for something to do with your little one while you wait for those cookies to bake? 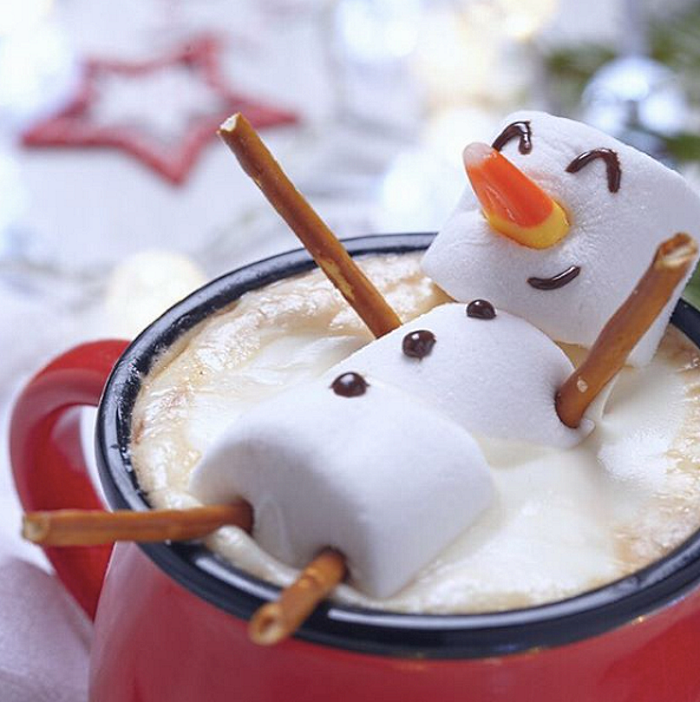 Whip up a batch of Edible Melting Snowman in play dough form! This Peppermint Bark recipe from, Sally’s Baking Addiction, is a keeper! The layers in this bar are super tasty. Grinch Cookies, from In Katrina’s Kitchen, are a new staple on our holiday cookie table! Decorating a Christmas tree doesn’t get any better than these Sugar Cookie Christmas Trees, from Better Homes And Gardens! How adorable are these Peppermint Stick Mice, from Sprinkle Bakes? Mom On Timeout‘s Peppermint Patties are easy to make, and addictive! How Do I Wrap Christmas Treats? This is the fun part! Get creative! The fun Fudge In A Cookie Cutter idea from above would look really sweet wrapped in decorated cellophane bags with ribbon or a bow. You can also wrap little boxes with wrapping paper, gift treats in a cute mug! Use your imagination, just make sure they are properly sealed to maintain freshness. Christmas treats literally make the sweetest gifts! Perfect for teachers, staff/ co-worker gifts, and favor bags! My daughter and I love wrapping plates of goodies for our neighbors! How Long Do Christmas Treats and Christmas Cookies Last? It really depends on each recipe and the ingredients involved, but most Christmas cookies and candies last up to a couple of weeks if chilled, and even longer if they are frozen. Doughs that mostly consist of butter tend to taste the best up to a few days after making them, but they are still good for a couple of weeks. The most important thing to do to keep your Christmas treats and Christmas cookies fresh longer is to package them properly. It is so worth it to invest in good quality airtight storage containers! You need to protect those goodies, after you put in all that hard work! 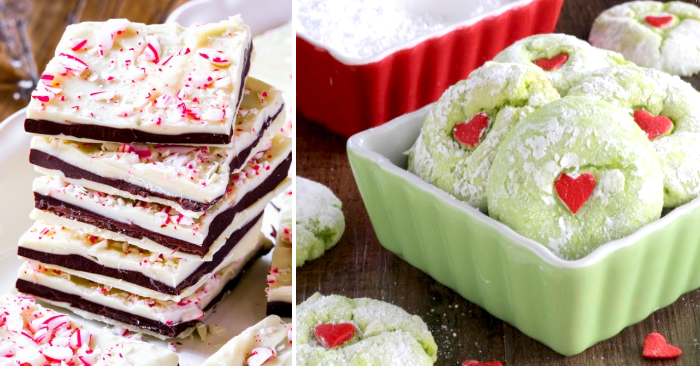 35 Ways To Make Fudge… You Have To Try These Recipes! BE SURE TO JOIN THE CONVERSATION OVER ON OUR FACEBOOK PAGE!